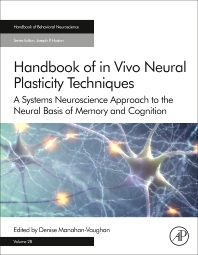 Handbook of in Vivo Neural Plasticity Techniques, Volume 28: A Systems Neuroscience Approach to the Neural Basis of Memory and Cognition gives a comprehensive overview of the current methods and approaches that are used to study neural plasticity from a systems neuroscience perspective. In addition, the book offers in-depth methodological advice that provides the necessary foundation for researchers establishing methods and students who need to understand the theoretical and methodological bases of these approaches. This is the ideal resource for anyone new to the study of cognitive and behavioral neuroscience who seeks an introduction to state-of-the-art techniques. Prof. Dr. Denise Manahan-Vaughan is head of the Department of Neurophysiology, Dean of Studies and Director of the International Graduate School of Neuroscience, and Chair of the Research Department of Neuroscience of the Ruhr University Bochum. She has served as a member of the Executive Committee and Governing Council of the Federation of European Neuroscience Societies, and as speaker of the Competence Network for Neuroscience of the German Federal State of Northrhine Westphalia (NeuroNRW), and is currently speaker of the Collaborative Research Consortium on Integration and Representation of Sensory Processes (SFB 874), funded by the German Research Foundation. Her research focuses on characterization of hippocampal synaptic plasticity as a learning mechanism, primarily through investigations of two types of synaptic plasticity: long-term potentiation (LTP) and long-term depression (LTD). Her multidisciplinary approach incorporates in vivo electrophysiology in freely moving rodents with in vitro electrophysiology using the hippocampal slice preparation, as well as behavioral analysis of learning, confocal microscopy, immunohistochemical, biochemical and molecular biological analysis. On a physiological level, her research examines how synaptic plasticity, place cells and neuronal oscillations contribute to learning and how learning drives synaptic plasticity in health and disease; this work combines in vivo electrophysiology and EEG analysis with behavioral learning models and animal models of brain disorders. Manahan-Vaughan is the author of 130 scientific publications, and her findings regarding the role of hippocampal long-term depression in memory processing have contributed to a revised understanding of how synaptic plasticity may contribute to information encoding and memory.